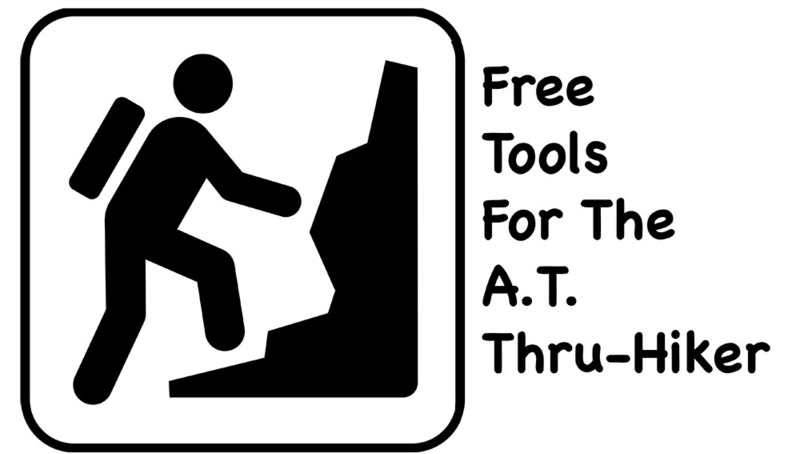 Some of the resources that a thru-hiker needs or wants are available for free in various formats. Here are my 5 favorites. The Hiker Bot app is a free tool that can take the place of Guthooks. Sadly, it is not yet available for Apple iWhatever products. But, if you are an Android user, check it out, it might save you $70. “HikerBot is the ultimate all-in-one app for long-distance trails, created by former and current thru-hikers. Hikers, trail angels, volunteers, trail-side businesses, friends and family, future hikers, or arm-chair hikers and trail enthusiasts will all find something useful. • Most up-to-date trail and town data crowdsourced by thousands of hikers. See water reports, snow conditions, stream crossing water levels, trail angel listings, bus schedules, restaurant and lodging reviews, and more. • Any user can add waypoints, photos, comments, update descriptions, and edit any content in the app, in real time. Think Wikipedia! All data belongs to the community and is not copyrighted. • Download topo maps, road maps, and satellite images for offline use. • Navigate using GPS while in Airplane mode. Everything in the app works while offline, after the initial data download. • View elevation profiles and compute distances to locations along the trail. • Order a resupply box (food, gear, maps, and miscellaneous items) shipped to any location on the trail. Browse our store and queue up multiple resupply orders from your tent, even while offline! Checkout when you are ready. • Share your location (optional) and see where others are on the trail. • See a real-time feed of contributions other hikers are making. • Search the map by name or point type, search the activity feed by hiker name, location, or type of edit. • Create a free listing for your business with information you’d like hikers to know. • If you are interested in helping hikers you can list your contact information and what you can provide (transportation, accommodations, help for injured hikers, etc). Inform hikers of any specific rules and set expectations. • Track the location of your hiker on the trail. • Send a gift card hikers can use in our store. • See real-time hikers reports of trail damage, blowdowns, and infrastructure maintenance needs (e.g., washed out bridges). • Explore and learn about the trail. See current photos, use the wealth of information and hiker reports to plan your hike and resupply stops. Just about everyone carries either the AWOL’s A.T. Guide or the ALDHA Trail Companion. On our thru, we carried the AWOL guide both in paper format (we had coil bound at our local Kinkos) and as a .pdf on our phones. We used both versions in different ways. Just because something is popular doesn’t mean there isn’t a viable alternative out there for it. And there is, and it just happens to be free. Download the .pdf guide from http://www.wikitrail.org/trails/view/at/appalachian-trail. You will notice the guide is patterned after the A.T. Guide and has a map for each section as well as an elevation guide and icons denoting common amenities like water sources, shelters, and tenting sites. Town information with hostels, stores, etc. is also included along with website addresses, phone numbers, and physical addresses. The latest version is from 2016 so it is slightly out of date, but still a great resource for the hiker on a budget. There is one thing certain about weather on the Appalachian Trail is that it is uncertain. The truth is that weather apps can only tell you so much. We had days where the forecast listed a 10% chance of light showers and we got drenched. Conversely, we stayed dry once when the forecast was 90% all-day showers. Really, by spending so much time outdoors you get to where you can “read” the weather pretty good. All that being said, if you are like me, you still like to see the data and to track the thunderstorms. We would check weather the first thing each morning before heading out (assuming we had a cell signal). It is nice to have weather informational services that can provide info. It’s also nice that a few of them are free. ATweather.org—This was the first app we used, and we loved it because the forecast was based on shelters along the way. You just select the state you are in and then the shelter nearest your location. The drawback to AT Weather is that it is overly broad. It’s like a horoscope, sure it’s right sometimes, but it can’t help to be. If it says 50% chance of up to a ½ inch of rain, it’s right regardless of what the weather does. There are other sites (like the next one) that give a breakdown by hour instead of the day. So, you could see the likelihood of rain and how much precept was expected for each hour of the day. We found this site to be accurate and we even planned our summit day based on its forecast. NOAA.gov—We did not use it, but have heard good things about The National Oceanic and Atmospheric Administration’s website. Check it out, it’s free. Ok, Postholer.com has many moving parts and you can get lost in data, gear-lists, journals, and oh, so many other things. My favorite section of the website though, is the Appalachian Trail Planner. This tool can save you hours of math-work and frustration. Basically, the tool allows you to input your start date and based on your hiking style and number of zeros taken, can pinpoint how many days a section will take you, or even forecast the entire trek. Or, let’s say you want to make it to Damascus, VA for trail days, the tool can help you plan a schedule that allows you to not miss any of the fun. Check it out! Much of our preparation for the trail was done by reading, listening, and watching info previous thru-hikers had provided. We bought countless AT books, listened to podcasts while on the treadmill during the Wisconsin winter preceding our hike and we, of course, watched countless hours from various hikers who had documented their journey on YouTube. Everyone knows that the YouTube content is free (our channel is YouTube.com/AppalachianTrailTales), but did you know podcasts are free? Did you know you can get your fill of eBooks free too? Well, they are and you can. Podcasts—Our favorite free podcasts are Mighty Blue on the Appalachian Trail (Chica and I even made it onto an episode), and Pox and Puss. Both podcasts are humors and informative … and free. If you are new to podcasts they are basically talk shows centered around a subject. You can play the episodes from your computer or load them up on your phone or iPod/MP3 player. eBooks—There are several ways to get free eBooks. You can just type Kindle Free Ebooks into the search bar on Amazon and it will return all books that are currently selling for $zero. To get the best range though, is to utilize a free membership to either Amazon Prime’s program or Amazon’s Unlimited program. Both have free trials that you can cancel before you get charged but there are some differences. Amazon Unlimited is a book only program which boasts over 1 million titles. Both of my books and two of Chica’s books are in this program. The Prime program offers fewer books but it also gives you the benefits of Prime membership, including FREE Two-Day Shipping for eligible purchases, and unlimited streaming of movies and TV shows with Prime Video. You can sign up for a trial to Unlimited here, or to Prime here. If you are a voracious reader, like me, and don’t just want to read AT related books check out https://www.gutenberg.org/. With over 56,000 free eBooks (many classics) you are bound to find a lifetime of great reads. Free is good and I hope you have found this post interesting. If you have a resource you think should be included, say so in the comments below. I’ll either add it or create a new post for it. Thank you, Greg! Dive in, the water’s fine! Both of you: this is absolutely one of the best “gear recommendations” ever! Thanks so much for posting this! And it is already proving great value as I prepare to depart on my thru hike next month!